True to the name, the pipes are exposed on the outside of the wall. 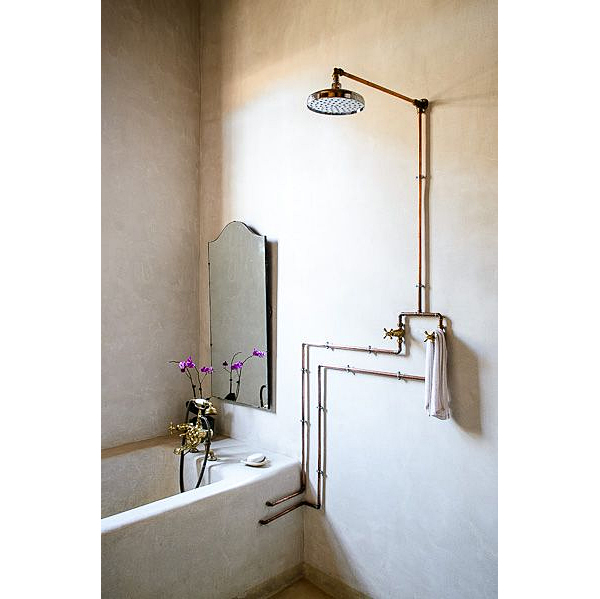 It’s also called exposed thermostatic system. 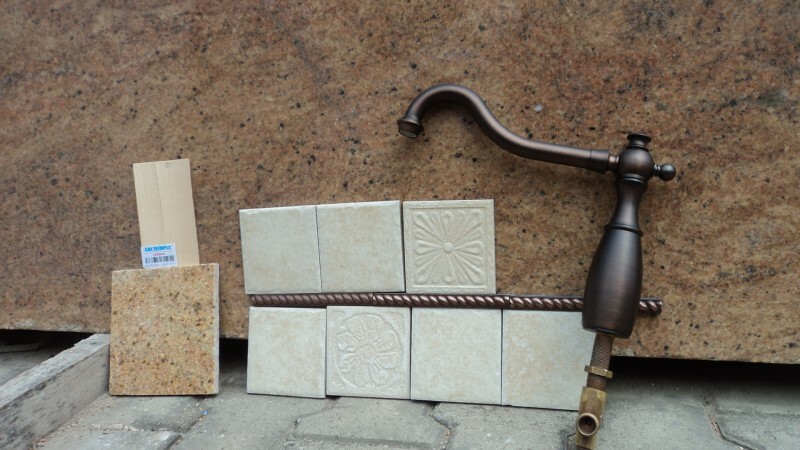 If you can get these finishes in Chennai, they will be special ordered and we will be there only 2.5 weeks and really want a shower while we’re there. Surely everyone around us will appreciate it if we shower too. So there’s no time for special orders. 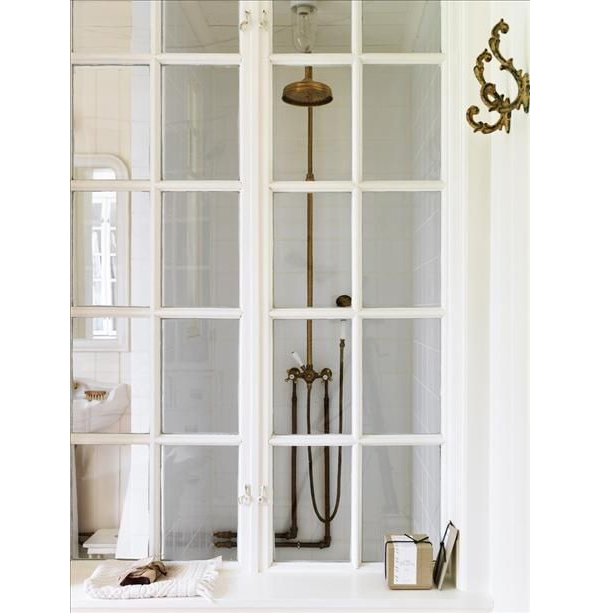 So I’m seeking shower plumbing in the U.S. to haul over in suitcases. !!! Yes. We fly Etihad and we get four large check-in suitcases between the two of us with 200 pounds of stuff for no charge. 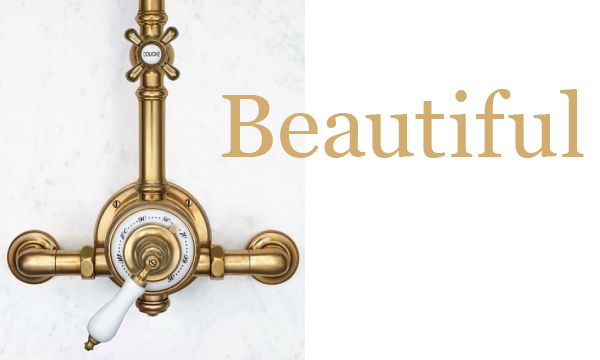 You can easily take bathroom sconce lighting, plumbing, sewing machine, drilling tools … yes that is our vacation packing list right now! 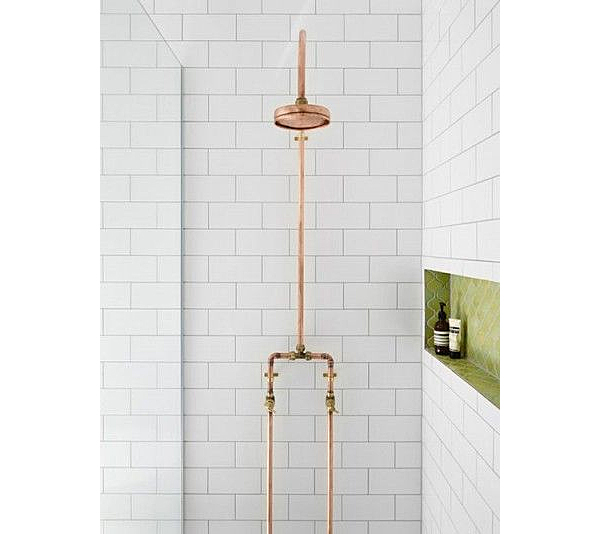 You can also build an exposed shower system yourself with copper pipes. 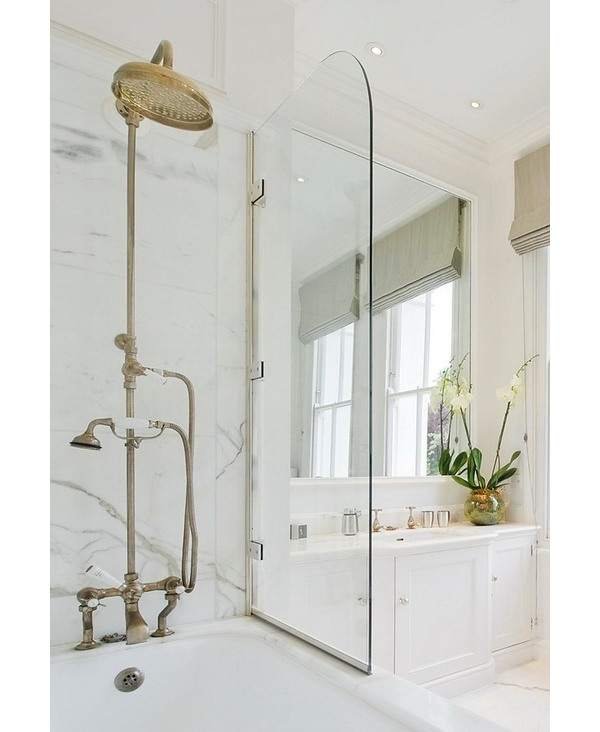 In the right setting, usually very simple and purposely understated, it can look charming versus just cheap DIY. So wish me luck. I hope we’re hauling finished shower pipe systems on Etihad instead of rigging up copper pipes in a pinch! 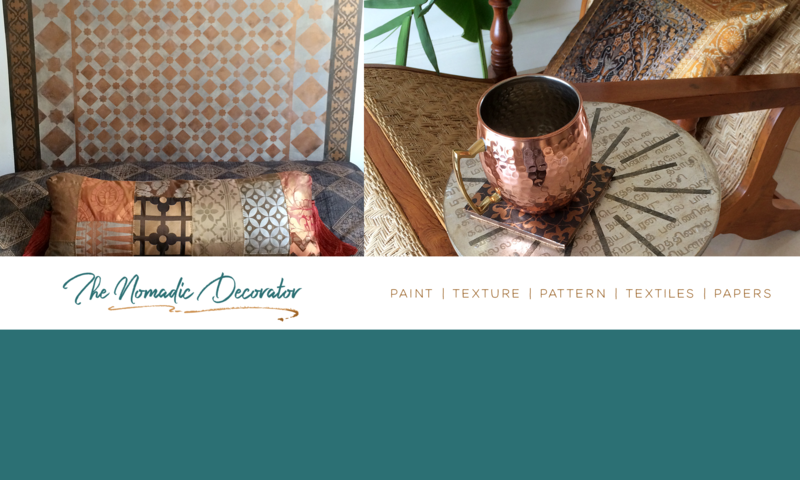 And I realized I’ve never shown much here after 1 1/2 years of blathering about the apartment, dining table and chair inspiration, Tuscan kitchens, farmhouse sinks, faucets and copper things, and blah blah blah. Not to mention buying a lot of stuff at HomeGoods. Meanwhile things have been happening for real in the apartment. To come clean, keeping secrets about the state of things has been kind of intentional. Why? I don’t have pretty photos to share. Don’t we all want our photos to be pretty? 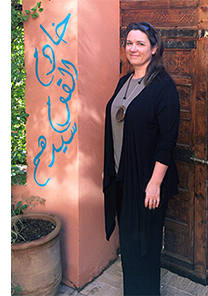 I had arrived bright-eyed and hopeful that we’d cook dinners there within a few days. People had been working in the kitchen for six months so we’re in the final home stretch, right? Ha ha HA. After three weeks, my expectations shrank to hoping for a 2′ x 2′ section of countertop where I could do a staged close-up: yellow Tuscan cannisters from Sur La Table lined up on the granite, next to the copper farmhouse sink and the bronze faucet, beige and copper tile backsplash in the background, a few spice bottles and the edge of a colorful French jacquard dish towel for accents … all giving the illusion that the whole kitchen was nice beyond the confines of the photo. But we didn’t even get to 2′ x 2′ of completed and clean kitchen! The last time I saw the kitchen, a few men were standing on counters, spraying noxious fumes to “finish” the cabinets, and other men were on the floor sanding a wood strip that we wound up scrapping. 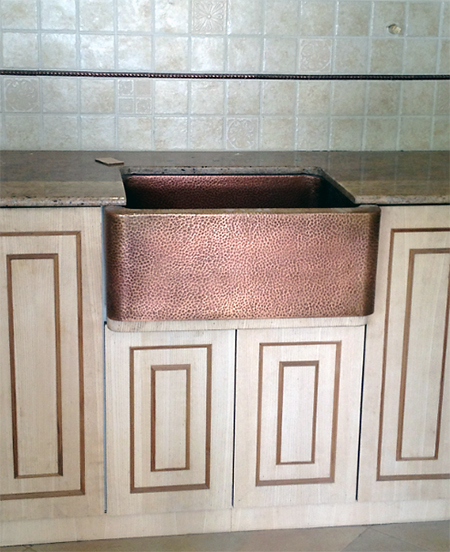 You can get many styles of copper farmhouse sinks from places like Copper Sinks Online, but ours was custom-made to size in Delhi by a company that manufactures copper sinks for U.S. retailers. We wanted to eliminate the expense of shipping from the U.S. to India. Our crew had never seen a farmhouse sink before! We had to play YouTube videos of farmhouse sink installations for them. We assured them the installation would be secure. But can you see that wood platform under the sink? Our carpenter did not agree that our instructions would hold the sink (this from the guy who had never seen a farmhouse sink before) so after my husband left India, the carpenter added that platform contraption underneath the sink. It’s too late to remove it now. Oh well. We could probably stand in that sink and it won’t move anywhere now. Our carpenter built all the cabinets on-site. 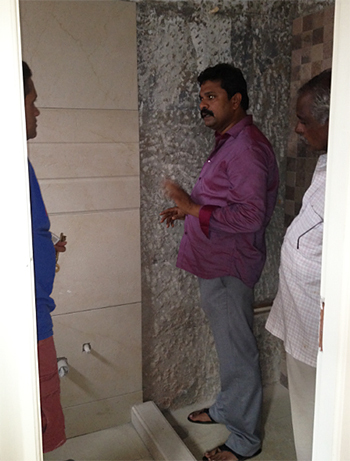 The granite and most tile was sourced in Chennai. 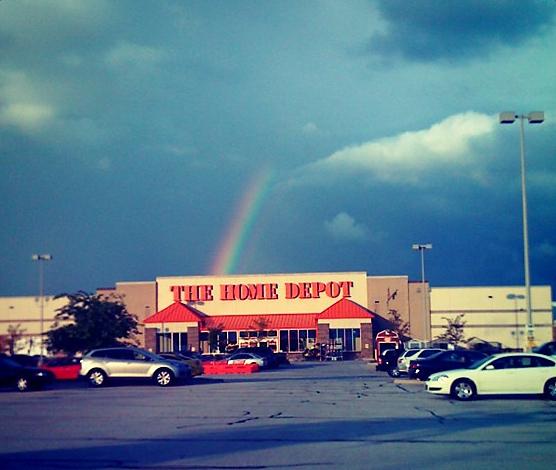 We found backsplash accent tiles at Home Depot that we hauled over in a suitcase — tiles that we found for a penny when a lucky rainbow led to Home Depot, true story! That top row there. Lookin’ a little different. 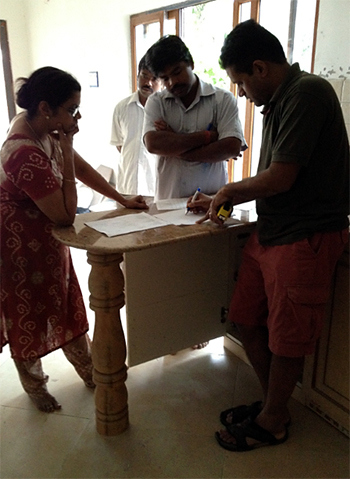 While we were in Chennai, we were on-site supervising every move. Then we left for three days to shop for furnishings in Cochin antique shops. 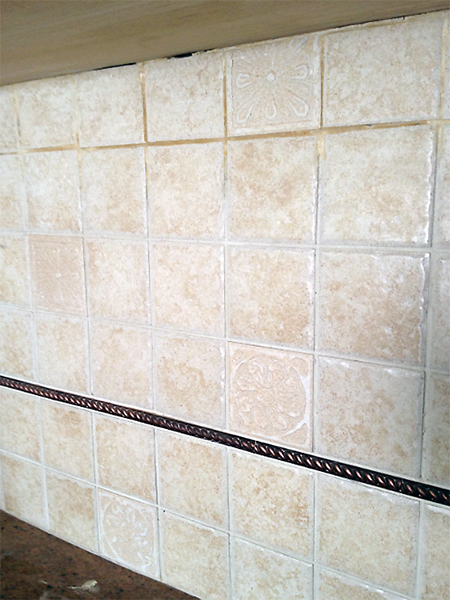 During that time, they brought someone in to finish the tile, to lay out the top row which had been missing. And … ugh … no words needed. 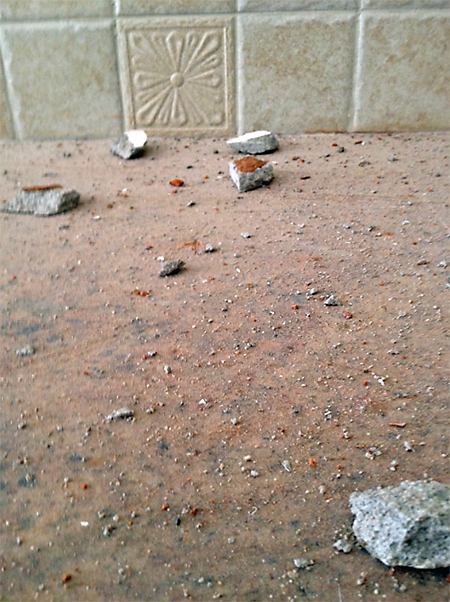 I think what happened is, terra cotta dust was everywhere from electricians drilling into the plaster and brick walls. Maybe the tile guy got his fingers covered with terra cotta dust, then used his fingers to smooth grout. 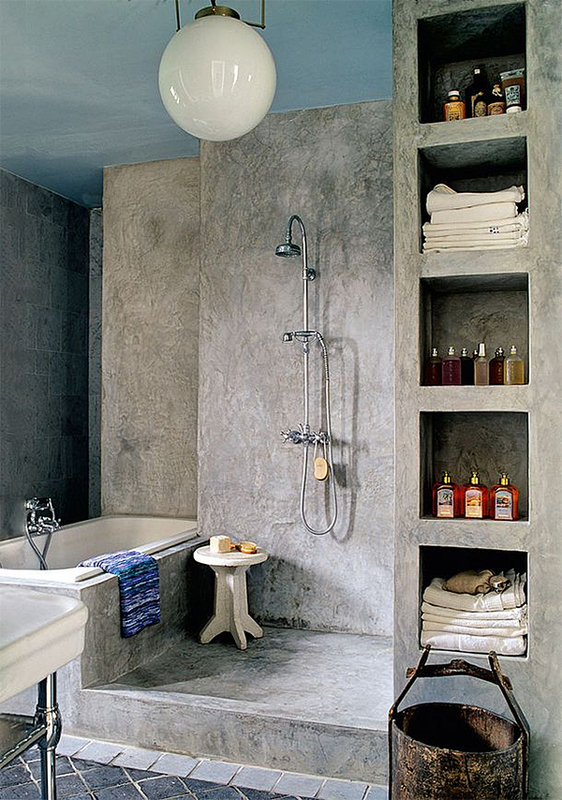 Which he shouldn’t have used fingers for that, as the grout texture is obviously smushed like he did. Our architect was dismayed and agreed this would be ripped out and re-done. What was this tile guy thinking?!? No lucky rainbow for us the day he was working in the kitchen, huh? So this is how it is, three steps forward, one step backward. Eventually we will get it done and there will be pretty pictures to share. It’s not just pigeons that bring messages. Owls can too. We know they are wise. 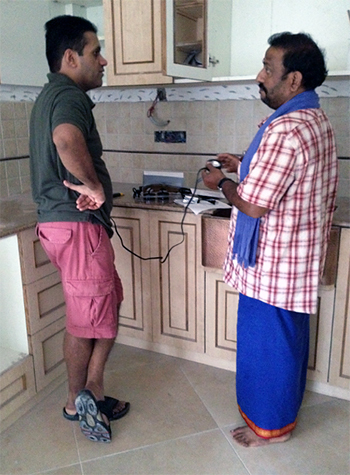 Three of us were in the Chennai apartment debating about ceiling fans (referred to briefly in the previous post) and perhaps we needed a break. We got it, delivered by a loud cardboard crash. We found an owl on the living room floor, sitting next to a dust-covered box, now etched with the outline of crashed wings. I approached, crouching and asking “are you OK?” Like it’s going to answer. The owl eyed me while I eyed its wings and legs from a respectful distance, looking for anything askew. My mind whirred. I’ve heard owls at night during our Chicago summers. I’ve seen them in photos and on TV. But never in person, right here. This guy is much bigger than parakeets we’ve had. What if it’s hurt? That beak looks sharp. I spot a towel nearby, to throw over the owl if needed. Can I grab it? Then what do I do with it? What do I put it in? Would I hurt it more while trying to help it? Where we live near Chicago, there’s a wildlife rehabilitation center in Barrington. We’d go there, and they’d know what to do. 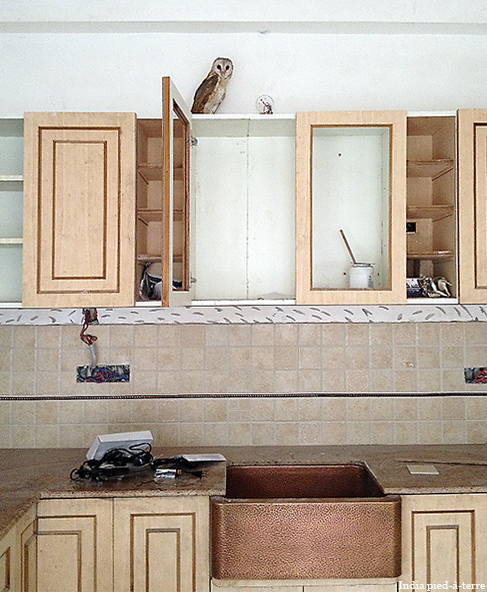 Who knows what to do with owls in Chennai? All this, whizzing around my mind within seconds. The owl probably had its own mind-whizzing going on in whatever way it understands. It decided to flap around the apartment, which feels big enough until a bird with long extended wings starts banging around everywhere … so fast … one wall here, one wall there, crashing into the ceiling … oh gosh, don’t hurt yourself! We’re now running around, flapping our arms, everyone and everything flapping. I run to a big balcony door and open it, showing the owl, talking to the owl, here … here … here’s how you get out. Now it sat atop the kitchen cabinets, resting. There’s an owl in the apartment and now we feel really responsible for it. We hadn’t noticed so many ravens until they flew after the owl. Watching carefully, you can see them fly off to the upper left. Now I felt sick. We don’t know what happened, but my husband thinks far off in the distance, he saw the owl out-fly the predators. My husband is a very optimistic person. More optimistic than me. Later downstairs, Amma said it’s a good omen to be visited by an owl, and good things will happen. The timing was full of serendipities — this was the first day both of us were in the India apartment together, having flown halfway around the world to see it after 18 months of construction. It was also the one-year anniversary of my husband’s grandmother’s death. For Hindus this could certainly bring wonderings about the young owl’s intentions. We heard later that our nephew saw the owl being chased by ravens, and it flew through his second-floor porch, but not through his open apartment door. The owl then avoided another open apartment door below us, and went out of its way to fly up around the staircase, around a corner, and through our open door. It was not the flight path of least resistance. At the time our nephew thought the owl, despite being chased by ravens, was specifically aiming for our apartment. 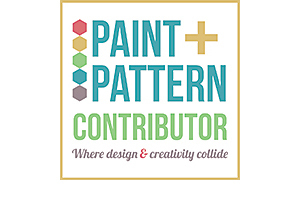 I have the easy job: research ideas, get inspired, edit the ideas, go shopping. Many more people are truly making the India pied-à-terre happen. Here’s introducing a few of them. Everyone has a team of people behind them so often there are a lot of people in the apartment working at one time. The electrician took us to lighting and ceiling fan stores. 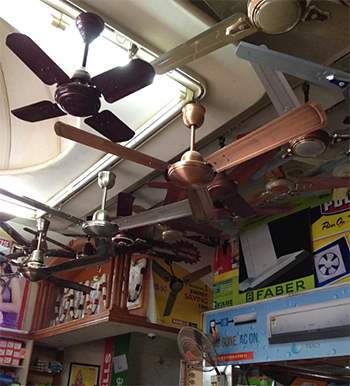 Ceiling fans are important in India. I’ve written previously about unique ceiling fan inspiration. 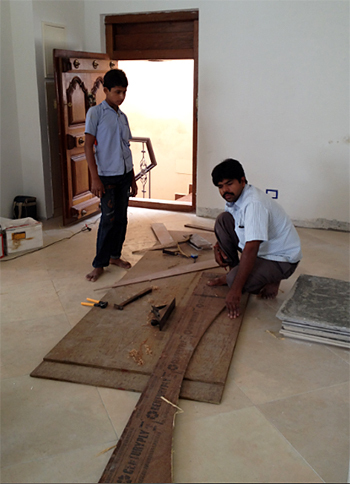 The fans we chose are different than I originally envisioned — I wanted to hold out for fans from a Fanimation dealer in Mumbai. But we want to get this place nearly done during our short time here. 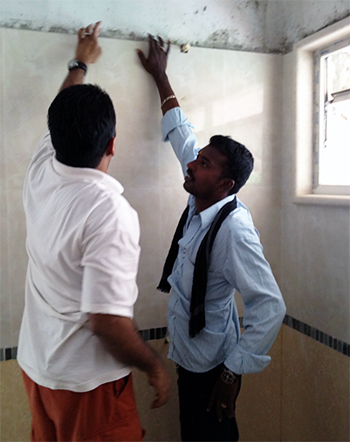 So we chose simple copper fans accessible nearby in Chennai. 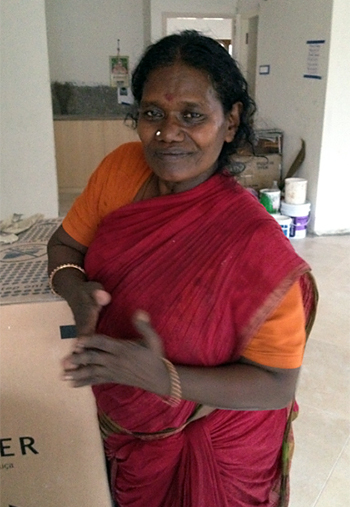 One of the family’s maids, who has been trying to keep the apartment as clean as possible between construction work. Just before this photo, she was frantically clearing water off a balcony to keep it from overflowing into the apartment — an insane amount of rain fell here last week. 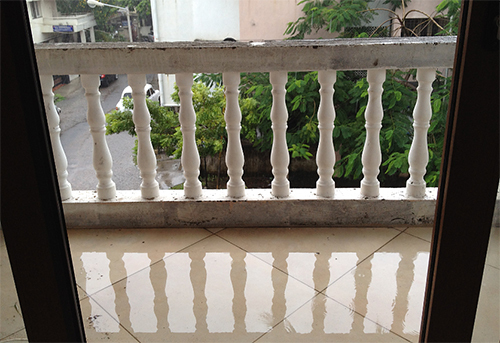 After this near-overflow into the apartment, we got more drainage pipes installed into the balconies.